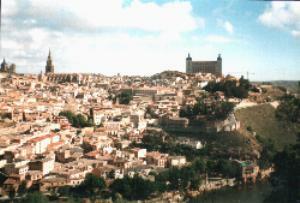 toledo, MAY 1999 - Not far away from Madrid, the capital of Spain, is a little town called Toledo. This town has a medieval look and many interesting historical buildings are preserved over here. When coming from the railway station, you can see the town on the hill, surrounded by walls and a river, a fortified city. 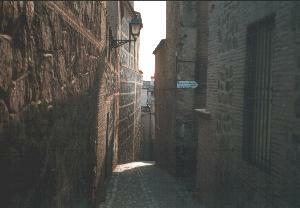 Obvious landmarks are the fortress (Alcazar) and several cathedrals. But to me the most interesting thing to do in Toledo is to wander around in the narrow streets, have a sangria on one of the quiet squares and watch the people in the streets and on the balconies. Just think for a minute you could be back in the Middle Ages of Europe.